With similar sustained throughput, and better random writing, the Gold is the gold standard for 12TB hard drives. WD’s Gold Enterprise drive offers a staggering 12TB of capacity and overall performance that’s equal to or better than rival Seagate’s 12TB offerings. 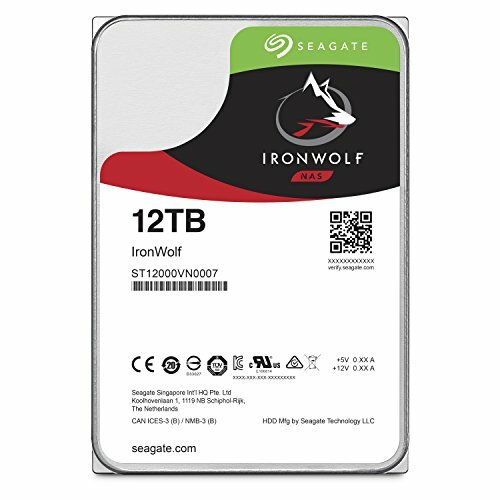 At $500 MSRP (currently $476 on Amazon), it’s comparable in price to the entry-level Seagate Iron Wolf, yet sports the features of Seagate’s Pro series drives. That speaks for itself. For anyone hoarding lots of movies, games, hi-resolution audio and the like, this drive will store them with room to spare. 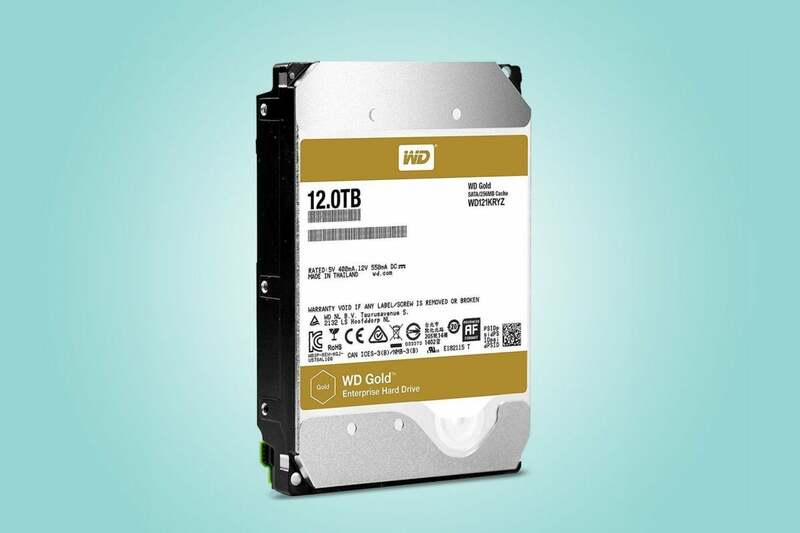 The WD Gold 12TB we tested is a 3.5-inch, SATA 6Gbps hard drive with 256MB of DRAM cache. It’s filled with helium to eliminate the atmospheric turbulence than can affect components that are as thin and light as those inside a modern hard drive. The Golds are listed as 7200rpm “class” on the spec sheet, which means that, according to WD, they spin at 7,200rpm. Class is generally a sign that there’s some small variance, but we’ve been told that’s not the case here. The Gold is available in 1TB through 12TB flavors. The 1TB through 6TB capacities harbor half the DRAM cache at 128MB. Moving up, the 8TB is available with either 128MB cache, or the 256MB cache amount also featured in the 10TB and 12TB flavors. 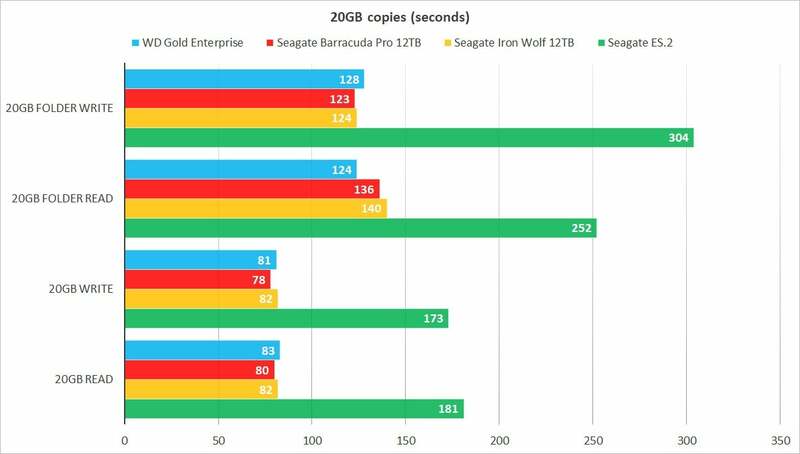 Unlike with some of Seagate’s lower-capacity IronWolf and Barracuda Pro products, which spin at reduced rates, all the WD Golds spin at 7,200rpm. The WD Gold also offers RAFF (Rotational Acceleration Feed Forward), which in effect varies the read/write head placement to compensate for any rotational vibration caused by the drive itself, or drives in close proximity (think array and servers). Seagate offers something similar, but only in its more expensive Pro drives. 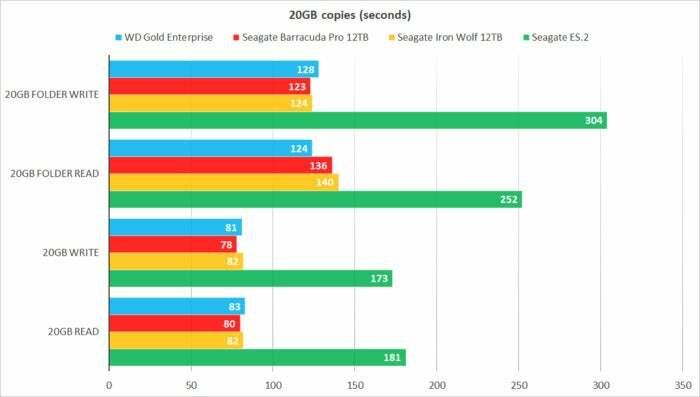 Overall, you’d be hard-pressed to tell the difference between the 12TB WD Gold Enterprise (shown in blue) and any of Seagate’s 12TB offerings. Longer bars are better in this chart, but the sustained transfer rates, both in the synthetic benchmarks and our own 20GB copy tests, vary by statistically meaningless amounts. There was really not much to choose from with the 12TB drives in terms of sustained read/write performance. The ES.2 is a very old drive, included to show how fast modern high-capacity hard drives are. Longer bars are better. Our real-world 20GB transfers charted below (shorter bars are better) also showed little difference between the Gold and its rivals. There’s still not much to choose from between the 12TB drives in our real world 20GB copy tests. The ES.2 drive is an antique thrown in to show how fast these 12TB drives actually are. Shorter bars are better. 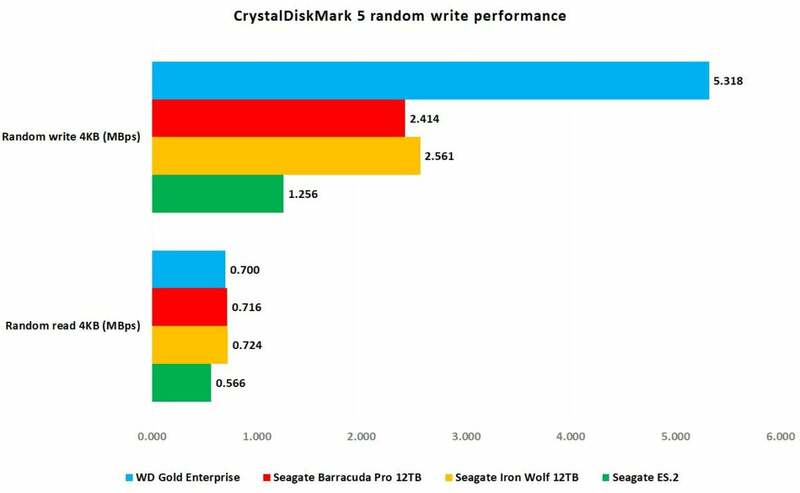 However, while random write performance is normally so similar between hard drives that we don’t bother discussing it, the WD Gold trounced its Seagate competition so thoroughly that we made an exception. Longer bars are better. Of course, the rates shown below are pathetic compared to the average SSD, but this is a battle of mechanical, not electrical, movement. One surprising result was the WD Gold’s 4KB random write performance doubling that of its rivals. Longer bars are better. As you can see above, with 4KB random writes the WD Gold was more than twice as fast as its competitors. This will be relatively meaningless for individual users, but for the enterprise or RAID, where small writes could be more common, it could make a difference. 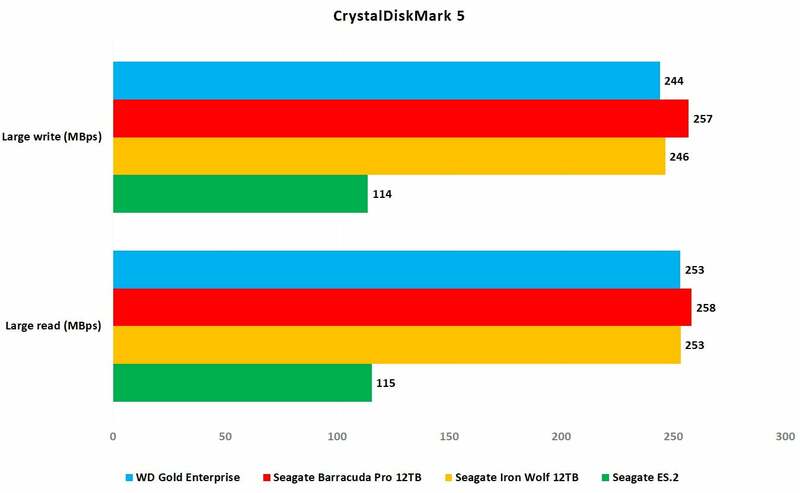 Though not charted in this article, the AS SSD benchmark showed the WD Gold’s random access time as less than 2 milliseconds, while the Seagate Iron Wolf and Seagate Barracuda Pro were in the slower 30ms to 40ms ranges. Note that AS SSD issues the FUA (Force Unit Access) command, which disables caching so that data is written directly to the most stable storage in the chain—the hard drive platters, in this case. With smaller 128MB caches and fewer platters, the less capacious Gold models won’t perform quite as well as the 12TB version. The drop-off as listed on WD’s spec sheet is from around 250MBps with the 12TB to around 184MBps with the 1TB version. That’s still a lot faster than the old-school ES.2 shown in the charts. All WD Gold drives are covered by a five-year warranty and rated for 600,000 load/unload (park/unpark the heads) cycles. MTBF (Mean Time Before Failure) is 2.5 million hours for the 8TB to 12TB models, and 2 million hours for the lesser capacities. The average failure rate (AFR%) is less than 0.5 percent for all models based on 219TB per year, though the drives are actually rated for 550TBW per year. We’d explain that if we could, but we’re guessing the failure rate might be scarier if the full 550TB was written. Not to blame WD, it’s just the nature of hard drives. Support is one of the few areas where WD lags a bit behind Seagate, which offers two-years' free recovery with its Pro drives. How many users this would ever affect we can’t say, but as we recommend the drives in pairs, anyone who listens to us probably won't need this service. The WD Gold has all the features that Seagate’s more expensive Barracuda Pro and IronWolf Pro have, but it's priced like the less-expensive Iron Wolf. So now I need to say it: The WD Gold is currently the best deal in a 12TB hard drive. Nice stuff from WD. As fast and in some cases faster than Seagate's pricier 12TB offerings, but as affordable as its rival's cheaper 12TB drives. That's a win/win situation when you're shopping for a high-capacity hard drive.